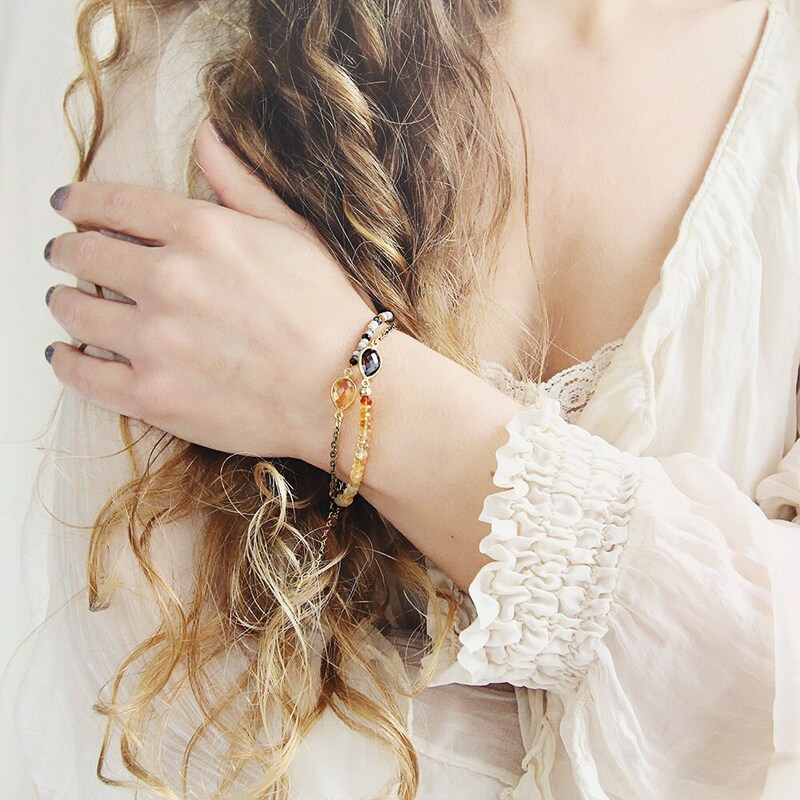 This beautiful citrine and dendritic opal bracelet will bring effortless elegance to your look, and a touch of natural charm to your wrist. Wear this cheerful October / November birthstone bracelet alone or stacked with others. The combination of soft colours means this lovely piece will work equally well for all seasons and styles, whether you're going glamourous for a special occasion in the winter months, or headed for a barbecue or the beach during the summer time. It will easily transition from day to night to transform your look. The lovely natural tones are reminiscent of the colours found at the beach - the colour of soft golden sand, shells in greys, whites and yellows, and the sunlight sparkling on the rocks. 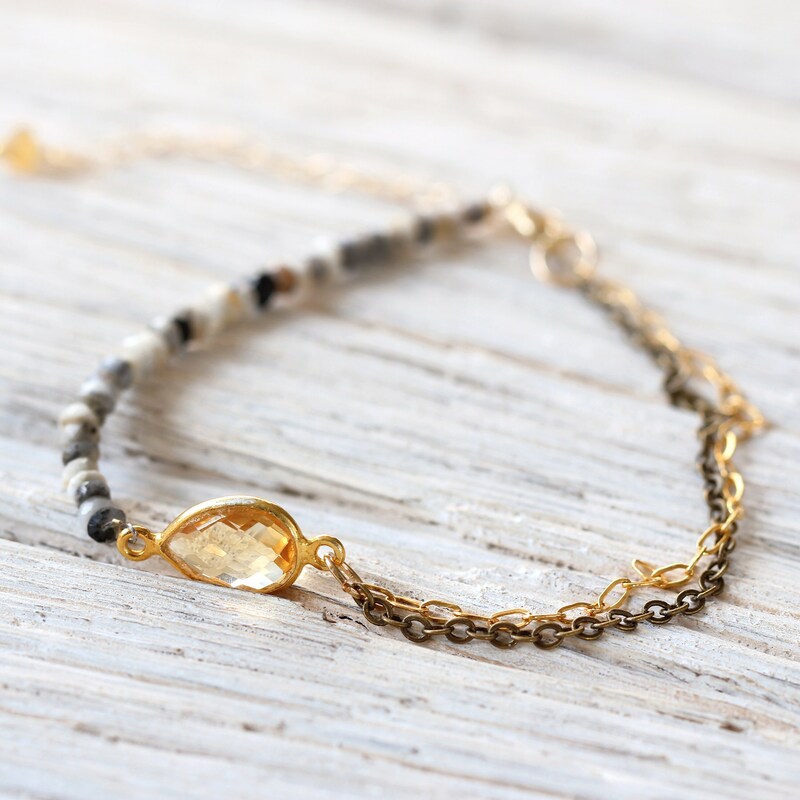 Regardless of where you spend your days, this gemstone bracelet will help you feel connected to nature whenever you wear it (can you feel the sea breeze already!?). The centrepiece is a gorgeous sparkling connector in citrine set in gold vermeil. On one side, natural dendritic opal stones have been carefully strung to highlight the wonderful variety of shading. Chains drape sensually on the other side of the bracelet (one in gold fill and one in bronzed brass), which set off the stones perfectly and add a unique element to this unusual bracelet design. Finished with a gold fill clasp, this bracelet measures approximately 7 inches / 17.5 cm in length, with an extender chain of 2 inches so the length can be adjusted to suit. 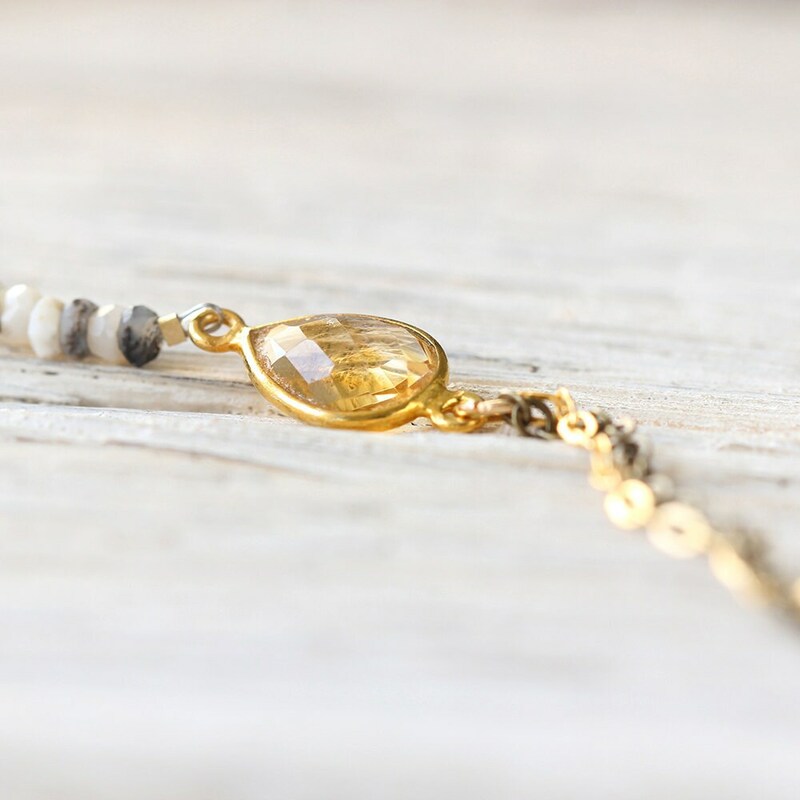 Finished with a sparkling little citrine bead at the end of the chain. 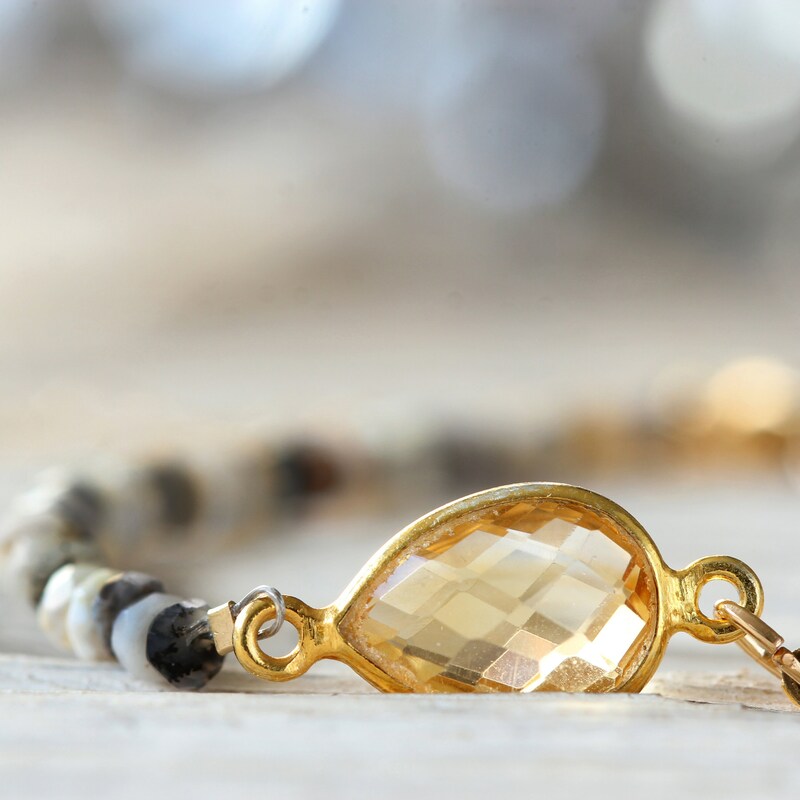 Citrine is the birthstone for November, and is known as the "success stone" because it is thought to promote success, prosperity, and abundance. 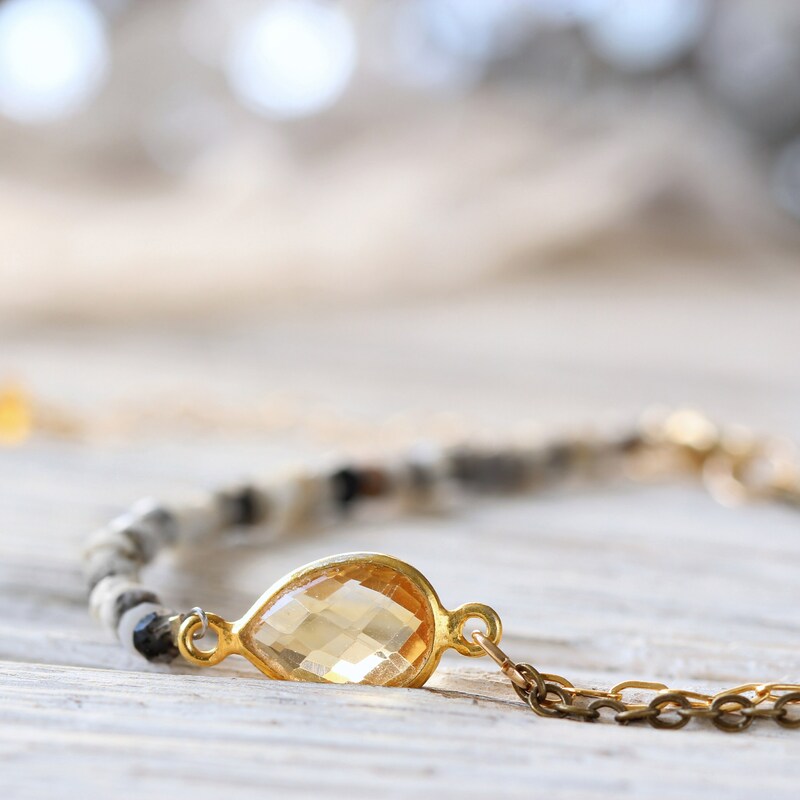 Citrine is a stone that brings happiness, cheer, enthusiasm and joy to one who wears it. It raises self-esteem and self-confidence, and is excellent for overcoming depression, fears and phobias. Opal is the birthstone for October, and is said to inspire optimism, enthusiasm and creativity, whilst allowing one to feel free of inhibitions and fears. 'Dendrictic opal' is a form of opal that has 'dendrite' markings which often appear to be shaped like mosses, ferns or trees. A truly beautiful stone. Makes a gorgeous gift for those who like their style to be unique and elegant, have a November birthday, or could simply benefit from the unique properties that these stones offer. * Adjustable between approx 7 and 9 inches. * Opal beads measure approximately 2mm. * Citrine connector stone measures approx 11mm.